In this session we focused on the trade routes that spanned the Fertile Crescent. 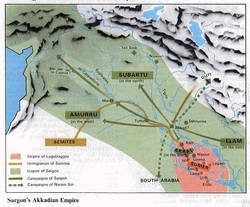 The central part of Mesopotamia, known as Akkad, sat at the centre of a network of land and river routes that over time extended ever further. Babylon in Akkad grew to be one of the largest cities in the ancient world. The trade in copper and tin ingots is the easiest to trace but its harder to find archaeological evidence pointing to what these were exchanged for. So we're down to speculation......you're guess is as good as mine but think of commodities that leave little trace but have lasting value. Suggestions from the group included textiles and wheat. The first city-builders passed on a substantial legacy. It seems that every culture that followed on in the Fertile Crescent area for the next 1500 years was keen to adopt the fashions, practices and technologies first seen around 3000 BC. Cuneiform writing came into use across the Fertile Crescent. 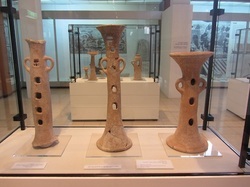 Reed styluses pressed into clay was copied as a method of writing local languages from Ugarit on the Levant coast to the Hittite kingdom in Anatolia. This suggests two things to me. One, nobody had had need for this 'writing' stuff, before someone introduced it as a concept. And two, the driving force behind the need to write diffused westwards from the south of Iraq. So I suppose I'm suggesting that a trade pattern emerged and was dominated by Sumer and Akkad, the wealthiest regions of Mesopotamia, and that everything else - the city-building, the ziggurat-building and the writing on clay - followed in the wake of the trade. In looking at the question of what commodities were traded, it's easier to spot the things that don't decay - metals and pots. 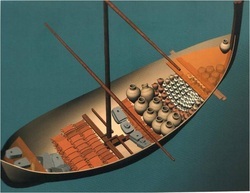 So, copper and tin ingots indicate a trade route that involved links with the Black Sea, the Eastern Mediterranean, Sinai and the Persian Gulf. Ingots like this are called 'oxhide' ingots because of their shape. They are abundant in sites surrounding the Eastern Mediterranean. But then there's the less tangible stuff. Inscriptions from Babylon describe masses of incense used in the rituals of the temples. Sources show that trade in incense, perfumes and cosmetics was hugely valuable in later times, especially after the opening up of the long-distance 'silk routes' after c. 300 BCE. The frankincense producers possessed legendary wealth in Biblical times (whenever that was! ), 'Sheba' being modern 'Saba' in Yemen. Babylon sat at the heart of a network of land, river and sea trade routes, which goes a long way to explain why it was taken over with alarming frequency. Everybody wanted a piece of the action it controlled. The 4.2 Kiloyear Event put paid to the ambitions of many societies, around 2200 BCE, when a sudden pattern of failed floods and failed rains toppled the known world. In Egypt, western South America, the Middle East and the Indus Valley cities were abandoned as harvests failed and people starved.